Tables for laboratories represent a frame structure with panels and color inserts made of sheet steel. Tables are available in various widths and have two heights: 900 mm for standing and 750 mm for sitting. When ordering, pay attention to the height of movable drawer units. 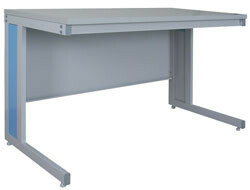 Low tables for laboratories without stand 750 mm. High tables for laboratories without stand 900 mm. High tables for laboratories without the rack 1200 mm. High tables for laboratories without stand 1500 mm.